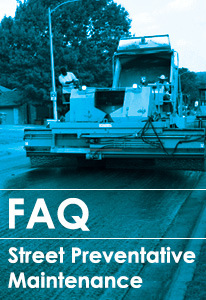 We use various treatments and applications in order to improve the roadway surface and lifespan of streets. Scheduled preventative maintenance helps prolong the life of the streets by protecting the surface from the effects of aging, cracking, deterioration, and water infiltration. Additionally, prolonging the life of our city streets saves time and taxpayer money by intervening before full reconstruction is needed. Click the image below to use the interactive 2019 Service Plan Overview. Simply enter your address into the search field in the upper left of the map. You can zoom in and out and move the map around to see what maintenance is happening near you and all around Austin. Seal coat consists of spraying a thin layer of asphalt and water mixture over the pavement followed by a thin layer of small gravel. This is done to seal the existing street surface and to increase skid resistance. This year, seal coat crews will resurface 360 lane miles on 500 streets between April and September. Learn more about seal coat. Mill and Overlay involves grinding up the existing asphalt and base material, removing it, and applying new pavement. The end result will be a much smoother driving surface. Overlay consists of a single layer of hot mix asphaltic concrete (minimum of 1½ inch thick; but typically 2”) used to level, waterproof, and restore the original street shape and ride. Learn more about Mill and Overlay. A slurry seal is a mixture of asphalt, water, fine aggregate and mineral filler that has a creamy fluid-like appearance when applied. Slurry seals are used to fill existing pavement surface defects as a preparatory treatment for other maintenance treatments. Crack seal consists of sealing the cracks in the pavement with a sealant or asphalt-sealing product to prevent the moisture from entering into the base and subgrade material. Fog seal is a light application of diluted asphalt mixture, without the addition of any aggregate applied to the surface. The seal is used to renew aged asphalt surfaces and to seal small cracks and surface voids. To report a pothole or other street maintenance need, call 311, visit Austin 311 online or download the 311 app.